It was Edgardo Alfonzo that got me. 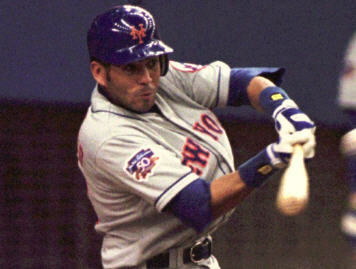 During the Mets’ All-Time Team event Sunday night –- the one that airs tonight at 7 p.m. on SNY, I should say -– Gary Cohen called Alfonzo the team’s “shadow hero,” the guy who always seemed to draw the walk that set up the big hit or drive in the tying run that led to the winning run in the comeback. And in fact, at the preceding reception and all others I’ve attended like it, most Mets heroes of yesteryear hold court among gleeful fans, smile for photos, point at each other fraternally and generally carry on with the type of understandable bravado developed from a post-baseball life spent encircled by admirers harping on their every word. But Alfonzo, the best second baseman in Mets’ history and an important part of what Sports Illustrated deemed “The Best Infield Ever” — he of over 1,500 hits and an .891 career postseason OPS and countless great games and big moments in orange and blue — seems content to stand or sit in some corner, nursing a drink and picking from the passed hors d’oeuvres like my wife and I do at work-friend weddings where we hardly know anyone. Thinking about that — and thinking about Alfonzo — got me choked up on my short walk home from the event. I even shed a couple of tears on 89th St., my first since Shea Stadium closed in 2008. Alfonzo’s only the medium, of course. Most memories don’t come neatly packaged or sharply edited like the baseball highlights shown at Sunday’s event, and there’s no archive we can rely on to summon them when we need them — no play or pause or rewind buttons on our consciousness. And considering Alfonzo, trying to recall his playing days and wondering what it was (and is) about him that pushes him to the margins at these things, inevitably brought back a flood of mostly indistinct memories of my late brother. It’s the fleeting feeling of what he was like, and what it was like to hang out with him and b.s. about baseball with him, and it’s the best feeling. And then, when I can’t get it back, it’s the worst. People say the holidays are the toughest time for missing lost loved ones, but that’s not the case for me. For me it’s right around now, in the crushing New York summer, when school is out and network sitcoms are on hiatus and there’s not much to mark the passing of time besides the steady crawl and awesome enormity of baseball’s regular season. I want to call my brother and talk about it but I can’t. But it would be weird, and it wouldn’t change a damn thing. It thrills me to see Alfonzo in the spotlight at events like Sunday’s because he deserves it, and because it seems like some odd form of validation for my brother’s appreciation of Alfonzo from his rookie year. Then I cry on the walk home because of the awful irony, because no recognition or highlight reel or ceremony can draw my own hero from the shadow for more than a moment. The Mets, you know, annually seek meaningful games in September. The phrase gets bandied about a bunch, in seriousness and silliness. Naturally, it refers on face to games that impact the pennant race. But really, is any baseball game meaningful? Or is every baseball game meaningful, in May of ’95 and September of ’99 and August of ’03 and in the sticky summer heat at Citi Field last night? What is any baseball player or baseball itself but a shadow hero behind our appreciation of beauty and greatness and chance, our understanding of joy and community and brotherhood and love? And why would anyone aspire to more?